Do you know of a good phonics program? Our district has recently adopted the Fountas and Pinnell phonics program. I haven’t done much with it yet, but the lessons are whole group with small group components that could be merged into your guided reading groups. LOVE this post!! Literally cannot wait for the next post!! Thank you, thank you, thank you for this info!! I’m excited to read more! I taught middle school math for 5 years, then transitioned into a technology position for a few years. Now I’m back teaching special education resource to 3rd graders and need all the help I can get! Hey Lauren! That’s so great that the entire class gets the OG phonics instruction. SO awesome! I haven’t used Fundations personally, but I use its “sister” program, Wilson. All of the multisensory instructional activities are so helpful, and I also like to add in word sorts as a supplement. Thanks for reading! I am extremely excited about this post! My college education also did not prepare me for teaching phonics at all. My school does have a phonies program (fundations) but that is very rarely enough. Can’t wait for future posts! Hey Kelly! I’m excited too!! Thanks for following along!! THANK YOU! I will be starting my student teaching in Aug. 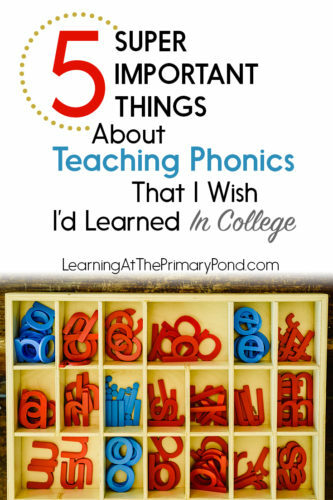 Although I have classes under my belt I do not feel one ounce confident in teaching phonics. (I am hoping this comes with experience eventually) Also, I have two older children that have dyslexia and struggle with their phonological awareness hence in reading. I cannot wait for your other posts! PS if you’re in So Cal can I privately train with you. Hey Brooke! I do think it will come with experience, although I’ve definitely done a lot of research on my own to become better at teaching phonics. I wish I was in So Cal – it’s too cold here! 🙂 Thanks for reading!! Yes, I’m so ready to read this! I cannot believe everything that I DID NOT learn in college. In my opinion, we weren’t taught the important stuff. I’ve figured out a lot on my own but would love to hear your information and the layout/order in which you teach. I am seriously looking into a phonics/awareness class to take but want to make sure it’s a good one! Yes! This is super interesting and important to me and my work! I’m a first year teacher and work with elementary ELs, I but studied to pass the test to get my endorsement on my own (no formal linguistics class), so I still have many gaps in my linguistics knowledge. Looking forward to future posts on this subject! Our school adopted a phonics program this year but I’m failing at teChinf it the correct way. We’ve had little to no help with how is the best way to teach it. I definitely feel under prepared. Thank you I’m looking forward to reading these posts. Hey Sasha! You’re welcome – thanks for following along! I hope the series is helpful to you! Could you include some research resources? I am totally on board with you, but have a reading specialist in my building that doesn’t think it is necessary for students to have explicit phonics instruction. She has said many times that if studenats are reading above grade level we do t need to worry about them. I do worry for them and the time the get to a text where background and context clues are not enough. Hey Jenn! Here are some resources to check out – hope this helps! Blevins, W. (2017). A Fresh Look at Phonics, Grades K-2. Thousand Oaks, CA: Corwin. Dahl, K. L., Scharer, P. L., Lawson, L. L., & Grogan, P. R. (2001). Rethinking Phonics. Portsmouth, NH: Heinemann. Excited to read the next post! How can I ensure that I don’t miss it? I am so excited to read your upcoming posts on teaching phonics. Would love to go through the OG training but do not have the money and our school district will not pay for it. So I hope to get a lot of information from you. I teach 1st grade. I do not feel I was well prepared to teach phonics. Hey Molly! I’m excited too, and I hope the series is helpful to you. I’ll also be doing a free webinar (likely in March 2019) about this topic, so keep an eye out for that. Looking forward to this series!!! I was just talking to my colleagues how we need a systematic approach to phonics. This is an area I struggle with in regards to my low babies and helping them decide when a doesn’t just say /a/. I looked into OG and Spalding phonics. I’m curios to hear your input. Hey Meagan! Thanks for reading!! Definitely check back for the next post, because it’s all about a systematic approach. There’s also going to be a link to some freebies that might be helpful to you. Hello! I definitely agree with you that systematic, explicit phonics instruction is a very key component of a balanced literacy curriculum. However, what would you say to a colleague who says they don’t think a balanced literacy approach is effective and that that we should abandon it for a phonics-based program instead? Hey Cindy! I think I would say exactly what you already said. 🙂 “Systematic, explicit phonics instruction is a key component of a balanced literacy program.” I have heard people say that the two are mutually exclusive (phonics and balanced literacy), but the very definition of balanced literacy is that it includes experiences with connected text AND explicit phonics instruction. At least that’s the way I learned about it. So for example, you might use leveled readers sometimes and phonics-controlled readers other times. What do you think? Thanks Alison. I always find your info very helpful. I love the way you consolidate learning and make it clear. Looking forward to the next posts. I cannot wait for the next post. I need some more things for my tool bag to help with my struggling readers. Just found your blog! It’s already a Godsend! I have started my Masters in Urban Education in Memphis, TN– in a Kindergarten classroom. While I don’t have my undergrad degree in Education, I do have one in Chinese language and resonate deeply with what you said above about how helpful a linguistics background has been to teaching English language+literacy. Thanks for what you do! Hi May! I’m so glad the blog is helpful!! Your master’s degree sounds like a great program! Where does your statistic for one in five students needing explicit, systematic phonics with multisensory techniques come from? Does your statistic of at least 20% of students show signs of dyslexia come from the same source? I would love to bring this up to my school, but I know they’ll want these answers, so I want to be prepared. Thank you so much Alison for the valuable information you are so willing to share. I can definitely benefit from a deeper understanding of the nuts and bolts of our English language, so that I may better teach and aid the students I have. I completely agree; I don’t think I came out of college feeling fully prepared to instruct and assist kiddos in learning how to read in kindergarten. Hey Cassandra! You’re so welcome – I’m glad it was helpful. Thanks, Alison, I enjoyed reading your post! I look forward to reading again. Yes yes yes! Thank you for this blog topic! I always feel inadequate teaching phonics. I had two courses in college on teaching literature and one of the professors actually broke down teaching phonics to us as if we were in her elementary class. However one class doesn’t do it! Thank you! Hey Beth! You’re so welcome! Thanks for reading! !